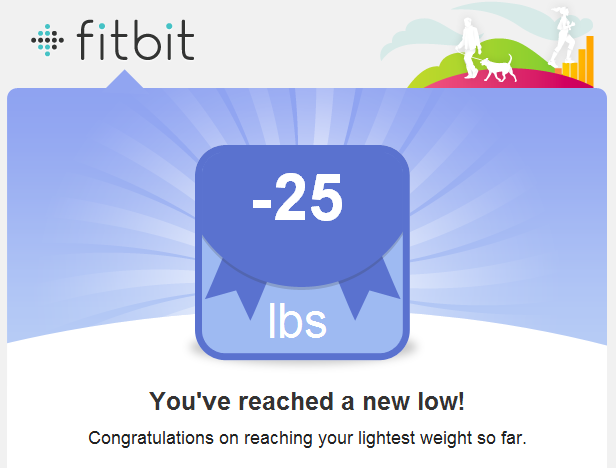 Zeigen » FitBit, Aria, and me: A life update — weight loss goal achieved! 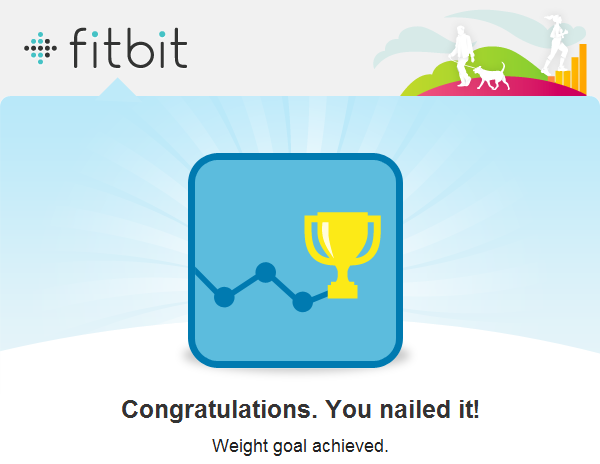 FitBit, Aria, and me: A life update — weight loss goal achieved! A year ago, a bit before Kimi and I separated, my weight had gone up from 165 in 2009 to 179 by the summer of 2011. This was mostly due to bad eating habits and a distinct lack of exercise. I’m 5’8″, and in order for my BMI to be “normal,” my weight should be under 164. So I knew I needed to lose 15 pounds. When I came back from Burning Man, there were some other changes. At work, my team and cube location changed. While I missed working closely with the individuals on that larger team, there was one thing that had been quite unhealthy about where I was: Many team members were constantly bringing in dessert items and putting them on a snack table in the middle of our cube area. I should have been able to use more willpower to resist, but I really didn’t do a good job there. While many of the desserts were homemade, and all were delicious, there were many items that were store-bought or particularly unhealthy, like chocolate donuts, that I should have been able to refuse, but didn’t. Once I was out of that physical area and stopped eating so many snacks, my weight started dropping quickly. Controversially, I think skipping breakfast was something that also worked for me. I stopped fighting against using caffeine, and I now have coffee with a lot of milk for breakfast, and some days I’ll have a few bites of cereal or some fruit — but other than that, I no longer eat a big breakfast. My portion sizes at other meals are smaller now, too. I don’t often snack between meals anymore. Starting from May/June of 2011 (when I weighed between 176 and 179), I made my way down to 170 in October just with those changes. Starting in October, I began working out more as well, mostly walking. I began dating and feeling more confident in myself, and was down to 166 in November. I was comfortable at 165 — I’d been at that weight for most of my adult life. I stayed at that weight for the next few months, but the trouble was, I was still officially “overweight” per the BMI scale, and I wanted to be healthier. My body fat was somewhere around 25%. So, I started using LoseIt to track my food eaten and to set a new goal of hitting 160 pounds by June of 2012. I was proud when I accomplished that. My body fat went down from 25% to 22%. After hitting that goal, my new goal was to lose 5 more pounds and get to 155 pounds and 20% body fat by August 26, in time for Burning Man. The next five pounds seemed much more challenging. To accomplish it, I bought and started using a Fitbit, and later an Aria Wi-Fi Smart Scale. I’d seen some friends use a Fitbit previously, but my main inspiration was seeing my friend Louis Gray use his and extol its virtues. It’s quite profound how much of an influence it’s had on me. I work hard to make sure I put in at least 10,000 steps (roughly 5 miles) a day. I run more. I climb more stairs. Now I find that when I go to the store or work, I don’t park close by — I usually park at the back to get in some extra steps. If it’s near the end of the day and I haven’t hit my goal, I put in an extra run or walk to make sure I do hit that goal. So far in August, I’ve exceeded 10,000 steps every single day. Much worse, however, is that Fitbit’s measurement of distance traveled is pathetic — it’s not a GPS at all, so it’s just multiplying your steps by your stride length to show distance traveled. For me, the default stride length for running was way off, and no matter how I adjust it, it still doesn’t accurately capture the length of my runs. I’m running a 2.2 mile circuit, and Fitbit records it as under a mile, no matter how I set it. So, I’ve given up on using Fitbit to measure distance. 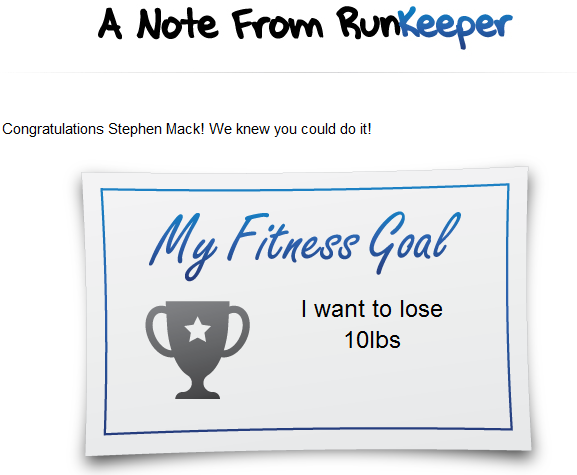 For my runs, I’ve now started using the RunKeeper app on my iPhone. RunKeeper is a free app that uses your smart phone’s GPS to accurately record distance and display your pace. It keeps track of my runs over time, and gives me a lot better insight into my pace, plus real-time feedback during the run. It also has a social function too, with your friends able to see your activity and provide inspiring comments, but I’m not as impressed by that part. Yes, it’s a bit unusual and inconvenient to carry a phone with me strapped to my arm while running — but, in addition to allowing me to track details of my runs, it gives me some peace of mind that in case of an emergency I have a way to communicate. I bought a relatively cheap velcro strap from Target designed for holding an iPhone, and it works well. So, the Fitbit tracker is great, and RunKeeper is great. How about the Aria scale, is that great too? Unfortunately, not so much. My previous digital scale (an “Elite” by My Weigh) is very accurate. I’ve tested it by taking my weight several times over the course of a half hour, and it always returns consistent results. If I pick up an item with a known weight (like a one or ten pound barbell) and then weigh myself, it always shows the correct result of my previous weight plus the exact amount of the item I’m carrying. In contrast, the Aria scale seems very arbitrary. First off, it inconsistently shows me as being between half a pound and one pound heavier than what I get from the Elite. Second, if I weigh myself five times over five minutes, I’ll get five different results, plus or minus anywhere up to half a pound. If I pick up a one pound book, the Elite shows me as exactly one pound heavier, just as I’d expect. But, depending on its mood, the Aria might show me as one pound heavier, two pounds heavier, half a pound heavier, half a pound lighter, or the exact same weight. There were two reasons why I bought the Aria: First, to wirelessly and automatically sync my weight with fitbit.com. Second, to measure my body fat. For the first task, the Aria works. 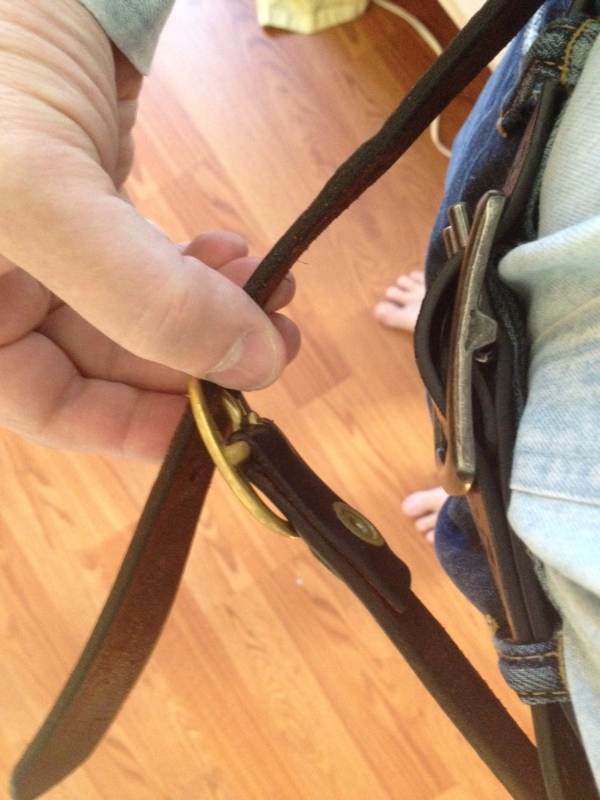 I never have to manually enter my weight. I get that 5 seconds back to live my life. I should therefore be able to pay off the investment in the Aria sometime in the next 43 years. Win! For the second task of measuring body fat, I give the Aria a D-. Its results seem ridiculously unreliable. When I first got it, it told me my body fat was 15%. That climbed up to 20% over the course of the first 5 days I used it. (I didn’t actually gain five percent body fat in five days.) I can get anywhere between 17% and 22% at any given time. I can get a result that’s more than 3% different just a few seconds later. I judge that I’m probably at 20% overall since that’s the most frequent result, but I honestly have no idea if it’s accurate at all. So, sadly, I don’t recommend the Aria. While I have my quibbles about the Fitbit Ultra, that is something that I do highly recommend overall. And using it has paid off. 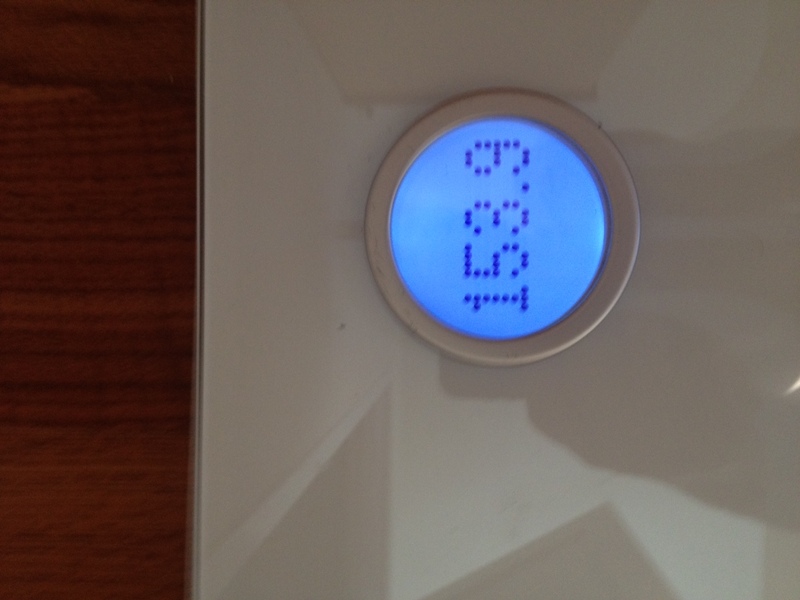 This morning, two days before my deadline, I weighed in at 153.9, beating my weight goal of 155. I’m more than 25 pounds lighter, now weighing less than I’ve weighed in more than 10 years. I’ve lost more than 5% of my body fat (probably!). My bad cholesterol is much lower. On my run last night, I broke the 7.5 minute mark for the first mile, and ran my 2.2 mile course in under 16:45. I feel healthier and more confident. I’ve lost at least two pants sizes (moving from a tight fit for a size 34 waist to fitting comfortably in a size 32). 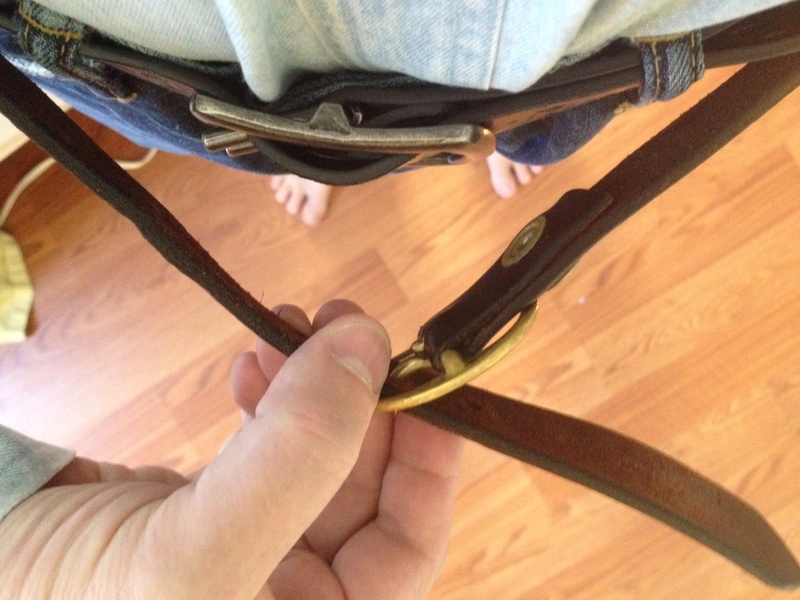 I’ve moved in 4 belt notches and then started using a new belt. I’m no longer self-conscious taking off my shirt to go swimming. I can run 10 flights of steps without breaking a sweat. I’m comfortably in the “normal” section of the BMI chart, and I feel that I can accurately portray myself as “fit” on a dating profile. I’m proud of how my legs look now. I plan on getting a new health assessment for my life insurance and hope to lower my rates. I’ve started doing some weight and ab training as well, and plan to continue that. 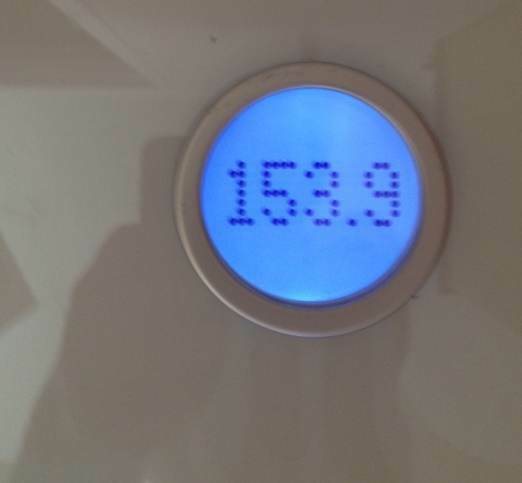 I’ve set a new weight goal of 150 by October, and a new body fat percent of 17. I’d like to break the 7 minute mile mark. (I could run a six minute mile in high school, maybe I could do that again at 45?) Those are, honestly, all stretch goals; I’d be very happy if I could maintain what I’ve accomplished. I’d also like to run a 5k in the next month. Made it this far? I’m now intentionally burying at the bottom of the post a bit about my marital status. Even though it’s now almost exactly a year since Kimi told me that she thought we should separate, I never managed to write about that here. (I posted about it briefly on FriendFeed instead.) I couldn’t really bring myself to blog about it; it was too painful. So I told my immediate family when it happened, and then told a couple of my co-workers and a few friends, and over time alluded to it here and there, and eventually updated my Facebook status to say “separated.” I failed to tell my cousins and aunts and uncles about it until a few months ago, and many of my friends and co-workers still don’t know. It’s still painful. Kimi and I are on speaking terms, and trying to work it out, and at the moment that I write this, we’re actually sharing a house in Sunnyvale and trying to arrange mediation and the best approach for making our kids happy and safe. We’re having some good talks, and I’m optimistic about the future. Not having to worry about my health — and the endorphins I get from a good run or walk — make it easier for me to work on what’s next for me, her, and the kids. This entry was posted by Stephen on Friday, August 24th, 2012 at 5:30 pm	and is filed under diet, exercise, family, fish, general, health. You can follow any responses to this entry through the RSS 2.0 feed. You can leave a response, or trackback from your own site. Way to go, Stephen! You have done a great job and hopefully I will be even more inspired to continue getting healthy myself. Kyrie forwarded me your blog post which I was delighted to read. Congrats on achieving your weight loss goal. I’ve just embarked on a similar journey having realized I’ve gained a pound a year for the lat 40 years! I didn’t realize the BMI was so inaccurate on the Aria – mine oddly waivers, but I love that it auto-syncs over my WiFi and graphs my weight loss over time (well, or that 5lbs I gained back while my ankle was broken because I’m a lazyass). I use the Nike app for GPS, I use it in sync with my 5k Runner app, which does interval training. I mainly use my FitBit for motivation. I stumbled upon this blog post while searching about body fat issues with the Fitbit Aria. I am a fit male. I measured consistently around 16% on the first day, yesterday I was measuring at 22%, and today I’m measuring consistently at 25%. My bodyweight is about the same +- 2 pounds. There seems to be something way off with those measurements. Given those numbers, I can’t see how I will be able to track my bf over time. Max, I think it’s true that the scale is very sensitive to water levels. I notice that even if I don’t dry off completely after a shower I can get a few percent changes in just a few seconds (especially if the soles of my feet are wet). just surfing the enterwebs and found your blog, very inspiring , way to go!! just had a comment about the body fat %. I believe the aria measures bmi by sending an electric pulse thru you body and measures the resistance. so how hydrated you are will make a difference in the outcome. plus you also need to be barefoot for best results. I remember reading it in the manual. It’s amazing designed for me to have a website, which is beneficial in favor of my know-how. you’re in point of fact a just right webmaster. The website loading pace is incredible. It sort of feels that you’re doing any unique trick. Moreover, The contents are masterpiece. you have performed a excellent process in this topic! Thanks for sharing your thoughts about lose weight in a month.